A great number of printing companies suffered through the recession that hit the global economy in 2008, and Shepherdsville, KY-based Publishers Printing Company was one of them. In the printing business since 1866, led by the Simon family for five generations, the company thrived in the publication printing industry. But the recession served as a wakeup call, and ownership saw the need to diversify. The Simon family spent a few years weighing their options, and by 2012 they decided that entering the labels and packaging market was a way for the company to continue printing, and also have a business that’s not so susceptible to the fluctuations in the economy. They put aside 75,000 square feet of manufacturing space, purchased a Mark Andy P7 Performance Series Press, a Rotoflex finishing unit, and called their new division Distinct Packabilities. To run this new labels and packaging entity, the Simon family brought in David Haley, who today serves as Distinct Packabilities’ vice president. Publishers Printing is still successful with its core business and employs roughly 1,500, and although Distinct Packabilities is relatively small with just 55 people working there, the company is experiencing significant growth. While Distinct Packabilities began as a label shop, Haley, who came on board with a flexible packaging background, stressed to ownership that they’d never get where they want to be by solely printing labels, and encouraged diversification into flexible packaging. Today, along with the Mark Andy, equipment includes a 52-inch CI (central impression) flexo press, wide web slitting capability, pouch and poly bag machinery, along with shrink sleeve converting equipment. “Other than making our own substrates, we’re pretty integrated as far as flexo packaging and flexo printing production goes,” Haley says. A large part of the Distinct Packabilities operation is its graphic arts and prepress department. The company makes its own plates; using the Fujifilm water-wash Clarity plate making process, which Haley says makes Distinct Packabilities something of a pioneer, being one of the first printers to use that technology. “We’re not afraid of being guinea pigs,” he says, alluding to not only the company’s plate making process, but also its most recent acquisition. 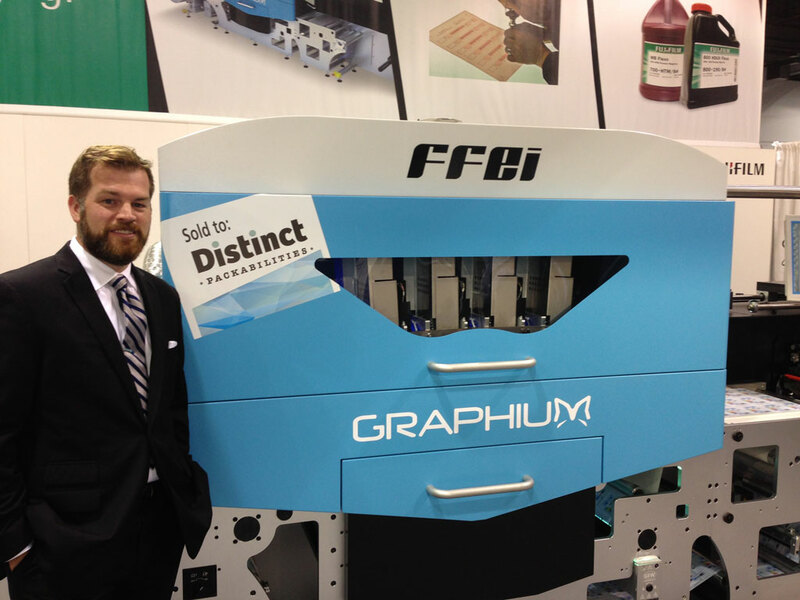 At Labelexpo, Distinct Packabilities became the second printer to purchase Fujifilm’s new Graphium, a digital hybrid, four-color plus white UV inkjet press integrated with inline flexo and finishing. Distinct Packabilities chose Graphium based on the capabilities of its hybrid design, incorporating digital and flexo printing into one platform, to create spot colors, respond quickly to short run demands, and its ability to produce flexible packaging and prime labels. Haley says Graphium offers a digital print quality and capability proposition that had previously not been available. The press is slated to be installed and running by mid-October. “Its print capability can produce up to 13,240 feet per hour at a resolution up to 1080 dpi and an eight-level grayscale. This digital press will print all of the common substrates found throughout our other production processes while achieving excellent adhesion, lightfastness and durability. Also, for us, the ability to very quickly move in and out of a rapidly changing print schedule is very important,” adds Haley. Distinct Packabilities will use the Graphium to help serve its core markets – prime food labels, gourmet foods in particular, and also the beverage industry. The company’s Kentucky location has it situated in the world’s whiskey mecca, which makes it a great fit for the lucrative, high-end spirits label market. Converting capabilities include embossing, cold foil, and rotary silkscreen printing. One market that Haley really likes – which the company is rapidly penetrating – is pet care, with its preference for flat-bottom bags. “If you look at the specialty and gourmet food markets, they’re not spending as much on packaging as they are in pet care. Some specialty brands of bird and fish food – in 12 and 16 oz. sizes – are selling for 30 or 40 dollars an item. Pet care brands don’t care about how much they are spending on packaging, they just want their packages to look nice, and they’ll pay more for it,” Haley says.